Pixbend Studio provides robust, reliable, and fault-tolerant Pixbend Technology video & audio encoding. Pixbend Studio lets you encode AVI video or still images sequence files to Pixbend Technology file format. This powerful tool provides you with all required functions and features to produce high quality Pixbend encoded contents with minimal effort. Pixbend Studio has a simple and user-friendly interface, allowing for an easy encoding process. Save your work at any time in two mouse clicks. Restore it later in just one click ! Low level codec parameters are computed by the program from high level parameters you set in the GUI. No need to be a digital video expert to get the best result. Most new users complete their first project in less than 3 minutes ! Pixbend Studio supports multiple input formats through a flexible plugin system, including AVI, YUV, Y4M, TGA and WAV PCM. Thanks to Pixbend Technology built-in stream tag manager and Pixbend Studio interface, embedding metadata within movies files is as simple as ABC. Pixbend Studio allows you to protect children by using its built-in content rating system. Pixbend Technology supports up to 8 audio streams and up to 16 subtitle streams in a single movie file. Pixbend Studio gives you an easy way to create and edit all language streams you need. 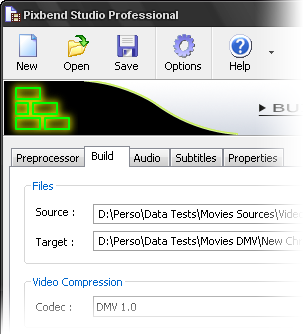 Get access to high motion processor feature in Pixbend codec. Nonsquare pixel support preserves the true resolution of DV and MPEG-2 content without distortion. Video content may be encoded using various rate control modes (including quality-based), making Pixbend Studio useful in a broad range of situations. Pixbend Studio has great video preprocessing capabilities, including efficient noise reduction and color correction filters. (*) Feature only available in Pixbend Studio Professional Edition. (*) Applies to minor updates only. (**) May require additional licensing. See Commercial Licensing for more information. (***) 1 user license. See Price List for full licensing programs.